Kimberly Gerry-Tucker is an author, artist and vice president of The Art of Autism, a nonprofit organization supporting autistic creatives. She is in charge of the P.O.D.S. (People of Diversity, Speaking) Project, one of the many programs sponsored by this nonprofit. After receiving an Asperger’s/Selective Mutism diagnosis in 1999, Kimberly stopped seeing herself as ‘less-than’ and felt empowered to write candidly about herself as a spectrum woman. Her memoir Under the Banana Moon was published in 2012. Her work has appeared in dozens of magazines, literary journals, anthologies and books, including Autism Asperger’s Digest, Kaleidoscope, and Women from Another Planet. Kim has been showing her artwork since 2005. She has exhibited work at Good Purpose Gallery in Lee, MA (where she also led a collage workshop) and Lesley College (where she has been a presenter). Her artwork has appeared in many books and on the cover of three: Artism: The Art of Autism, Shattering Myths About People Living on the Spectrum (Sicoli Group Inc), Selective Mutism In Our Own Words (Jessica Kingsley Publishers), where she also has several chapter contributions, and Everyday Asperger’s (Your Stories Matter, England). Kim is also a software tester (finding bugs in software), and her other passions include raising actual bugs, her two cats Georgie and Po, environmental protection, painting animated trees, collecting vintage papers for collage (her latest perseveration! ), autism acceptance and advocacy, and building faery villages. Kim lives in Connecticut and is the mother of three grown children. 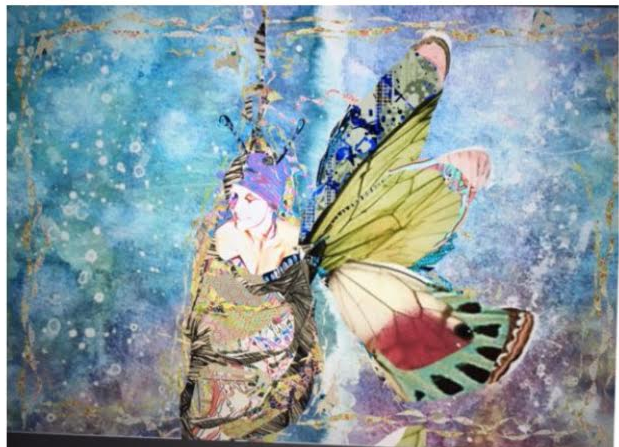 After viewing her artwork, read about Kimberly's journey, her dual diagnosis and her advice for young women on the spectrum. Background Image for the play "A Train"
Myrna Beth Haskell, managing editor, asked Kimberly about her contributions to The Art of Autism, her dual-diagnosis and the inspiration behind her artwork and writings. When did you become a board member of The Art of Autism, and can you tell me a bit about your role as vice president? I believe it was about a year and a half ago. I work with the founders, Keri Bowers, president, and Debra Muzikar, secretary. Besides me, the board has several other autistic members: Thomas Iland, Carly Fulgham, and Greg Jones. Dr. Lamis Jabri is a physician, psychiatrist and mother of a son with autism. I am the only East Coast board member – the rest live on the West Coast. I edit blogs before forwarding them to Debra or Keri - which I absolutely adore doing! I had a chance to ‘coach’ writer Stephen Gaiber (“The Autistic Traveler”), who has shared blogs on The Art of Autism. I’ve suggested contests, such as the Children’s Art Contest in honor of Women’s History Month, and I’ve also done some judging for contests. My role with this organization and learning about nonprofits has been very rewarding. I see that you are in charge of the P.O.D.S. (People of Diversity, Speaking) Project for The Art of Autism. Can you tell me more about this program and how it has been received by the community? I drew inspiration from HONY (Humans of New York), which is not affiliated with The Art of Autism. I am a very visual person and HONY is a collection of snapshots and interviews from ‘all walks of life.’ P.O.D.S. is a page on the Art of Autism, but it is really so much more. It is a visual representation, a mosaic or patchwork quilt of sorts, highlighting abilities and the broad diversity that the autism community truly is. It thrills me to see so many autistic people - of all ages, backgrounds and ethnicities - use art in its many forms (music, theater, acting, dance, songwriting, painting, sculpting, writing, and poetry) as a means of expression. Oftentimes, the art that is given life through our hands would never have gotten out through our mouths. P.O.D.S. is presented as a paragraph or two and a snapshot for each person. But, collectively, P.O.D.S. is People of Diversity, Speaking through their art – and this has always been my passion in life for as long as I can remember. You have a dual diagnosis – Asperger’s (which is now listed under the umbrella diagnosis Autism Spectrum Disorder) and Selective Mutism (SM). Could you explain Selective Mutism to our readers, and is this a common additional diagnosis for those on the spectrum? It is very common for autistics to have a comorbid condition (a medical condition in addition to their autism). Selective Mutism is a complex childhood anxiety disorder [although the disorder can also occur in adults] characterized by an inability to speak and communicate effectively in select social settings, such as school. People with selective mutism are able to speak and communicate in settings where they are comfortable, secure and relaxed (selectivemutismcenter.org). In the book Selective Mutism In Our Own Words: Experiences in Childhood and Adulthood (Jessica Kingsley Publishers), I speak candidly about the myriad emotions that flooded me because of SM. It’s a very misunderstood condition and, unfortunately, there’s shame - especially if you aren’t diagnosed and don’t realize that others are struggling to make sounds just like you! It’s not about ‘not trying hard enough.’ This book is perhaps the book I am most proud to be part of. It seems that your most comfortable means of expression has always been through the arts. What is the underlying inspiration for most of your work as both a writer and a painter? Sometimes ‘hard to process’ thoughts and emotions need an escape valve. I realized this connection a long time ago when I correlated the connection between my favorite singer getting his heart broken in real life and the amazing song lyrics created from this despair. I liken it to those pans my mother used to have with the tinkling escape valve that allowed steam to get out. I asked her what would happen without the vent hole. She said, ‘Simple - BOOM!’ Art is my vent. As a seven-year-old child, I was a passionate party planner. I planned for hours and hours…for days. These were detailed, themed parties: place-cards artfully designed, party favors, games, song lists, desserts, etc. Years later, I realized that the important part of this was the creative outlet because I never actually HAD the parties. When you are naïve and also happen to be autistic and someone with SM, people can take advantage of you because you are vulnerable. These experiences are hard to be at peace with. Whether I am carving wood, painting, collaging, doing mosaics, miming, or any other creative expression, I find I am channeling peace. Art is necessary. So is writing. I look at my art - sometimes years later - and I can finally see what problem I was working out in my head. Click image above to learn more about Kimberly's memoir. ​You are the mother of three children and a successful professional. What would you tell a young woman on the spectrum who is afraid to follow her dreams because of fear of failure, anxiety or a low self-esteem? I think I would say to a young person on the spectrum - or anyone - that none of this matters. I felt less-than my peers until I realized there are many ways to have a voice, and some may even be unconventional. I decided I was going to work from home because my anxiety, poor depth perception, slow reaction times, and high startle reflex impaired me enough that I don’t drive. I used to think this made me flawed. I adjusted my mindset to think, ‘Why is it a given that every human being must operate a 5,000 pound hunk of metal?’ I now do all my work from home, and it works for me. Nurture and attend to the positive things in your life. Ignore the others. What you focus on will grow. If you focus on feelings of hopelessness, that will grow, too. Like a loved plant, what you focus on will grow. I am always reinventing who I am. You should, too. Keep moving forward. What is YOUR ‘normal?’ That’s what is important. You are not alone. Find support in the online autistic community – you will get a sense of belonging that you have never known. Keri Bower's upcoming film in 2020.